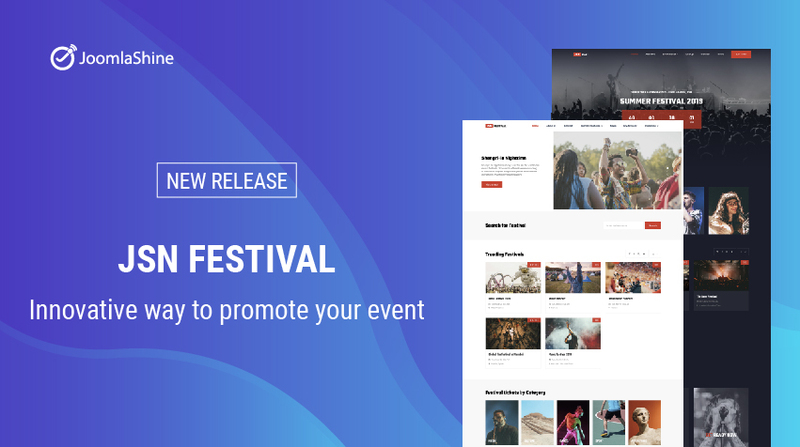 This month, say hello to our latest Joomla event template, JSN Festival - a template specialize for promoting festivals with advanced event booking extension. The template is the ideal combination of our professional design with an innovative solution for event booking - JTicketing. Thanks to the partnership, JSN Festival will not only make your event website management tasks easier but also bring out the best of your upcoming event. So, how JSN Festival can achieve it, let’s find out in detail in this article. With JTicketing, you can create a new event and manage them easily right on the front-end. You can see immediately the change as well as it will save you a lot of time going back and forth in the administration. Besides that, you can keep track of all activities in your site with one monitor display in the back-end, from sale report, coupon, to upcoming event. Showing everything your visitors need to know with one simple but advanced interface. Not only you can see pricing, detail location with embedded Google map but also activity stream, additional information which customizable. JSN Festival show just a mere of what it can be done. JTicketing extension provides you a lot more exciting features like calendar, image gallery, option to add to waiting lists and so on. If you need a printable ticket design, you could use one of our 5 available ticket templates come within JSN Festival. You can customize it easily with Joomla default editor. However, with a little bit of HTML knowledge, you could change the design in any way you like. The only limit is your imagination. Are you tired of boring, plainness email confirmation? Make your mark in the customer mind with beautiful and professional email template. Email confirmation is an important step in the buyer journey. Although the function of this email is to provide the customer with invoice and detailed information about their ticket, you can make it more professional with JSN Festival email template. The same as ticket template, it’s effortless to customize and come with 5 different pre-built layouts for you to choose from. JSN Beat - A niche template for a single event. JSN Beat is a unique niche template for a music festival. You can take advance JSN Beat to create any festival website you want. With much fewer sample data, you can create a site a lot faster. Besides equipped with modern, elegant design and work perfectly with JTicketing, JSN Festival also have top-notch features of JSN Sun Framework. Flexible layout position. Easy to customize. Six color themes to choose from. Saving time with pre-built pages: About Us, Coming Soon, 404. Integrated with Joomla! Page Builder extension: JSN PageBuilder 3. Introduce JTicketing - Ticketing for your Events made easy! JSN Festival is a Joomla event template work perfectly a robust ticketing system, JTicketing. A completed package for every demand needs for an event and festival website. Moreover, you can try its all amazing features for FREE. Let’s take a look now.